In 1951, Henrietta Lacks, a poor, black tobacco farmer and mother of five, sought treatment for cervical cancer at Johns Hopkins. In the course of her treatment, without seeking consent, doctors took cells from her tumor for research unrelated to her treatment. The HeLa cell line became the first immortal human cell line, and the basis for numerous major medical and scientific breakthroughs. Her husband and children didn't find out about this until twenty years after her death, and when they did, it changed their lives. 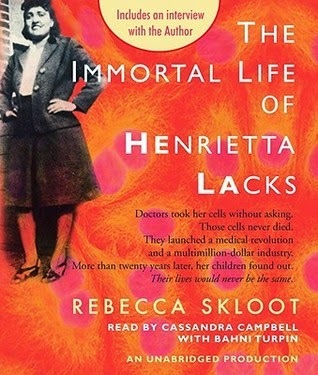 In alternating chapters, Rebecca Skloot tells the story of Henrietta, her illness, and her family's struggles in the years following, and her own research into the woman behind the cell line, including meeting her family and developing a friendship and partnership with Henrietta's daughter Debra. We learn the importance of the HeLa cell line, the research whose results we all benefit from today. We learn about the family, hardworking, battling poverty and lack of education, deeply affected by the loss of Henrietta--and without health insurance while the HeLa cells went on to be a multi-million dollar industry. Skloot explores not just the experiences of the family, but also the medical ethics issues involved and how medical ethics evolved in part in response to the ramifications of the HeLa cells, and in part in response to other social changes. At the time, doctors at research and teaching hospitals routinely took samples from patients for research without seeking consent. The Tuskegee syphilis experiment, begun in 1932, would continue for another two decades after Henrietta's death, until 1972. Even now, with better, stronger informed consent rules and procedures, it's nearly impossible for patients to either have any control over what happens to their tissues after removal, or to derive any financial benefit if, like HeLa, they become very, very profitable. This book includes a very thoughtful exploration of why patients have so far been denied that input and control, and how the current rules do and do not benefit science. It's a complex issue, or rather set of issues, and the book would be worthwhile if only for this discussion of the human and scientific ramifications of these questions. Yet that's a small part of the story here, and Henrietta's experiences in the late forties and early fifties, juxtaposed with the experiences of her children, especially her daughter Debra, and of Rebecca Skloot as she does her research, decades later, make for a deeply moving and compelling story. The audio edition includes an interview with Rebecca Skloot.